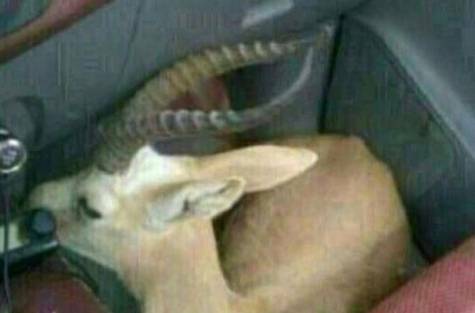 The gazelles apparently escaped from a reserve in the center of Saudi Arabia, according to Gulf News, and a group of at least four men hunted them down over a period of several days with rifles and desert vehicles. 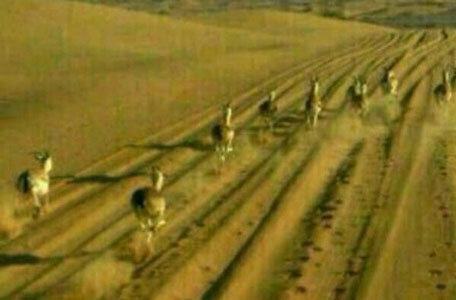 In one image the gazelles, an endangered species that is protected throughout the Arabian peninsula, are seen fleeing for the nearby valleys to escape their would-be predators. Once the men killed the animals, they proceeded to either string them up from trees or stuff them whole into cooler boxes and small spaces inside their vehicle. Like a group of Kuwaiti poachers that killed a wolf last year, these men then photographed the carnage, and posted a film in which they are seen bragging about their conquests in Arabic. It is illegal to hunt gazelles in Saudi Arabia, and locals are calling on authorities to dole out harsh punishments for the crime. The men’s faces are clearly visible in the short video clip, which appears to have been recorded on a phone. 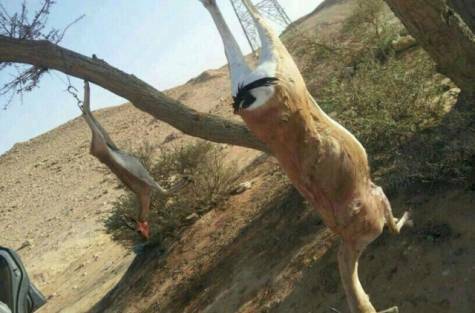 Such violence toward wildlife is relatively common throughout the Middle East region. One commentator from Belgium, responding to the Gulf News story, blames these kinds of senseless killing sprees on what has become a rather idle culture. “People are bored stiff in this country and that is why they do things like this. Many hate animals. Youngsters have no respect for animals. Read the Quran please about the love of animals,” the anonymous reader wrote from Belgium. Indeed, there are many tenets in Islam that acknowledge the interconnectivity of all life and the importance of environmental stewardship. So this is certainly not a religious issue. But it should be a legal issue. Past transgressions have gone largely ignored, so poachers don’t fear negative consequences for their behavior. Let’s hope this time will be different. Karma will get these men, one can only hope. Thank you for your brave reports on these issues, Tafline! And thanks for your continued readership, Aviva! Nothing will be done as they say this is traditional sport. There was no outcry when the Oryx in Oman were hunted by the Emiratis who came down and as a result the UN took away the heritage status of the Oryx reserve. There are virtually none there now I believe. The poachers were given laughable fines. Nothing will come from this in Saudi Arabia. Try it in the Emirates where the oryx are linked to tourism then you may find something will be done to stop it. Machismo rules the World to extinction.